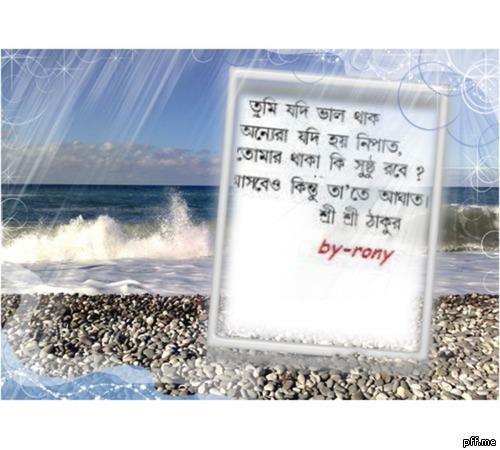 Mrinal Pal Abhik Das I am sharing a very interesting story on the posting you made above. I was initiated at Karimganj Assam in 1954. There is a nearby town named Silchar near karimganj. There lived one disciple named B. G. Saha (brojogopal saha) by profession painter and artist too. He was financially poor but having high spirit. He went to deoghar to see Sri Sri thakur for his better fortune. One morning he arrived at Deoghar wearing pyjama punjabi (two rupees ten annas in pocket), one gamchha, pillow and bedsheet. After thakur pronam he narrated his condition of poverty. Since he was an artist Thakur permitted him to write thakur's bani on art paper and sell those to bhaktas with marginal profit. So he started writing thakur's chhara's from Anushruti and started selling. 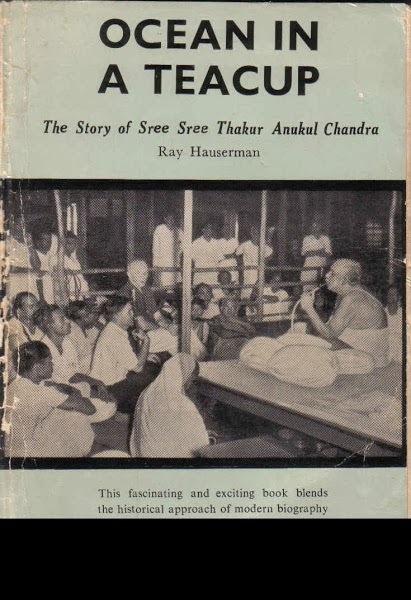 In the beginning at the end of the chhara he used to write Shri Shri Thakur as per practice. By divine grace of thakur his practice brought him a huge profit specially during the utsab season. His posters became very popular and even after extra hours of work it was very difficult for him to cope up with the ever increasing demand. As his profit grew and popularity increased he added his name below shri shri thakur as follows "artist - B.G.Saha"
Slowly the script ----"Shri Shri Thakur" below the bani became smaller in size and the script "Artist - B.G.Saha" became bigger and prominent. In course of two and years he made a fortune of 5000 Rs which was considered to be a big amount those days. He then Thought of retuning to his home town Silchar with the cash and kind he acquired in Deoghar during his stay. He sought permission from Shri Shri Thakur and Thakur gladly permitted him to go to his home town and start his profession a fresh. He purchased Rail ticket and now on way to Silchar. Those days passenger have to disembark at Amingaon Assam and cross the Brahmaputra river by Ferry and on the other bank at Pandu he has to catch the train for Silchar. But due to late running of train he arrived at Pandu at 11 P.M. whereas the train for Silchar left on schedule at 9 P.M. Now The Great B.G.Saha spread his bedsheet on the platform and lied on that with his pillow under his head and all other belonging by his side. The next train was schedulde and 1 P.M. next day. Our great gurubhai got up in the morning and found all his belongings were stolen. Only thing remained with him was the bedsheet, the pyjama punjabi, railway ticket and cash Rs two and ten annas in his pocket. So, he returned to his home in due course. For quite some there was charchaa among us as follows "B.G.Saha thakur bari gelo pyjama punjabi aar du taka dosh anna niyee aar fire elo oi pyjama punjabi aar du taka dosh anna niye." Kritiranjan Nath Superb@ Mrinal da. You are requested to continue sharing your experiences with us. You are one of those lucky and virtuous souls who had the fortune to be with Him! My salute to u. Jaiguru.